We started to plan for Christmas shopping early this year. I’m debating on a laptop. I’d really love to get a new Macbook, however I still can’t justify the price for mere web surfing during my commute. It’s too expensive for a web browser. As for the kids, I’ve been holding them hostage on good behavior with the 3803 piece Lego Deathstar since the product was first announced. They may get it after all. Devil is in the Details – Sometimes a slight change a little details can alter the look of the overall picture. In my response to a commenter’s question, I talked about my design process for this blog site. That Usability Guy – We know what usability is, but we often don’t get to work with a usability specialist. What do they do exactly? Presidential Teas – photo illustrations of the candidates from Jack Cheng, made up of tea leaves. The Importance of Sitemaps – Jeff explains the benefit of having sitemap.xml from a technical and SEO perspective. The Visual Science – A new typography blog I discovered. It has some nice showcases. Dwell Blog – I don’t know how I missed this, since Dwell is one of my favorite subscribed magazines. Apparently it has a blog. Silent World -I’m a big fan of B/W photography. Michael Kenna work is amazing. It exudes sophistication through simplicity. Ralph Clevenger -I’m also love vibrant colors and contrast. You’ll find plenty of that in Ralph’s portfolio. 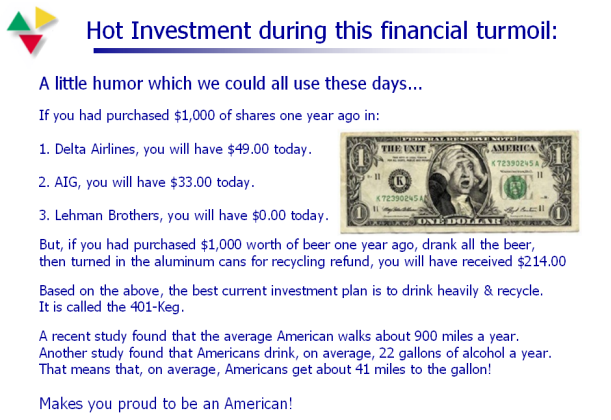 Investment tips during this financial turmoil. Take On Me: Literal Video Version. Someone really needs to do a literal version of Baby’s Got Back imo. I actually have the Air and it’s probably the best notebook for travel around today, mainly because it’s so light and yet sacrifices very little (can even do Photoshop work on it fairly nicely, as well as programming, writing etc — not so nice for gaming/3d obviously or watching movies because then the fans come on and its quite loud compared to normal state of no fans). Now thinking of selling it however to get the new MBP, which is mega expensive. I have a very old first gen MBP as well, but that’s showing its age. Love the look of the new ones though — especially the glass screen. Don’t understand why people dislike the glass so much; to me it looks and feels like more premium material than the standard plastic layer everyone else uses.